I really hate it when you ask someone how they’re doing and they reply, “busy.” We’re all busy. It’s not a competition. In the past couple of months I ran an election campaign and got elected to the board of directors. I finished a nine-course Coursera certification. I ran a half marathon. I went to a conference and gave a talk. I’m managing the whirlwind of end-of-school-year activities. And I’ve planned a trip for the summer. 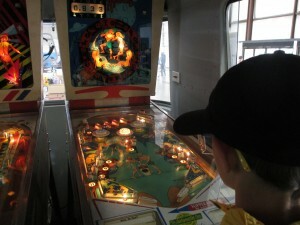 In general, I’ve felt like a pinball, banging around from one thing to the next. I just want to take a nap. While I haven’t gone so far as to actually take a nap (honestly, who has time for that? ), I have been pretty good about making sleep a priority. I’m still coming down from the whirlwind of a week of being “on” at the conference, followed by an early flight home to get The Assistant from an early dismissal day, and then two days of Maker Faire. When the alarm went off at 4:45 for spin class, I turned it off and went right back to sleep. I didn’t even feel guilty about it, because I knew that my body really, REALLY needed rest. At the conference, I made a point of getting out of the conference rooms and spending a little bit of time outside, even if it was just a short walk to the CVS to buy water or snacks. I spent an entire pre-conference afternoon hanging out with a friend, which was great for my brain. And I tried my best to at least start the day off right by maximizing my consumption of the fresh fruit on the breakfast buffet each morning. And since I’ve been back, I’ve done a good job of making quick and relatively healthy homemade dinners. Yesterday was panko-crusted chicken with raw veggies. Tonight will be Asian broth soup with homemade potstickers. Tomorrow will likely be some variety of beans and rice because I can cook it in the pressure cooker/rice cooker and have it ready when we get home from The Assistant’s Brazilian Jiu-Jitsu class. I’m going to take advantage of the relatively normal routine of the last 10 1/2 days of school, try to get back into a groove, hope that his teacher ends homework early (oh please oh please oh please), and keep my eye on our excellent summer plans. How do you manage when things get out of control?